In 1991, Jeff and LeAnn Wills purchased Vincenzo’s. At the time it was tiny, consisting of only five picnic tables on Bouquet Canyon Road. The Wills made it their goal to create a local pizza shop that conducted great business by providing delicious, affordable, and authentic Italian pizza. This became a family affair. Their children, Mike and Aly, began helping with the pizzeria while still in their teenage years. Jeff and LeAnn taught their kids how to successfully operate Vincenzo’s, the way that a local business should be run. Expanding twice within a few years of opening until there was no room to grow, we moved our location across the street to our current location on Plum Canyon Road. Mike, their son, is now the General Manager. We are proud to be one of the few 100% family owned and operated restaurants in the Santa Clarita Valley. We are a pizzeria for the local people, and ran by local people. Stop in today to experience our authentic Italian pizza, exceptional service, and local atmosphere! 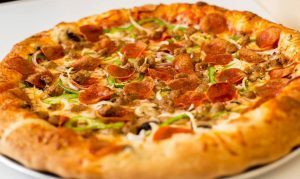 Find out why Vincenzo’s is the top rated local pizza place of Saugus, California.